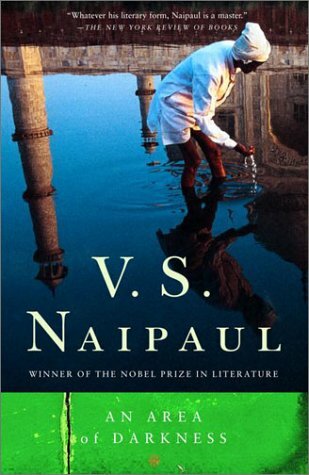 A classic of modern travel writing, An Area of Darkness is Nobel laureate V. S. Naipaul’s profound reckoning with his ancestral homeland and an extraordinarily perceptive chronicle of his first encounter with India. Traveling from the bureaucratic morass of Bombay to the ethereal beauty of Kashmir, from a sacred ice cave in the Himalayas to an abandoned temple near Madras, Naipaul encounters a dizzying cross-section of humanity: browbeaten government workers and imperious servants, a suavely self-serving holy man and a deluded American religious seeker. An Area of Darkness also abounds with Naipaul’s strikingly original responses to I ndia’s paralyzing caste system, its apparently serene acceptance of poverty and squalor, and the conflict between its desire for self-determination and its nostalgia for the British raj. The result may be the most elegant and passionate book ever written about the subcontinent. Un magnifique carnet de voyage sur l’Inde. Naipaul écrit comme on peint, par petite touches. On le lit lentement, en savourant sa vision, acerbe, et parfois amère de son pays d’origine. Comme il le laisse plusieurs fois entendre, il est le mieux à même de pointer les contradiction de l’Inde puisqu’il en est un lointain produit, mais aussi parce qu’il elle lui est étrangère. On trouve dans ce livre une foule de petites anecdotes croustillantes qui assemblées nous emportes loin vers l’est ! This concept of Englishness will survive because it was the produce of fantasy, a work of national art ; it will oulast England. It explains why withdrawal was so easy, why there is no nostalgia such as the Dutch still have for Java, why there was no Algeria, and why after less than twenty years India has almost faded out of the British conciousness : the Raj was an expression of the English involvement with themselves rather than with the country they ruled. It is not, properly, an imperialist attitude. It points, not to the good or evil of British rule in India, but to its failure.